The bar for what's considered successful keeps rising, as does the number of potential competitors. Drugs that help the immune system fight cancer are making a big difference for scores of patients, and stocks tied to companies developing them have done wonders for quite a few portfolios. The Loncar Cancer Immunotherapy Index, which tracks a revolving basket of drugmaker stocks that fit in this niche, is up 31.5% over the past year. 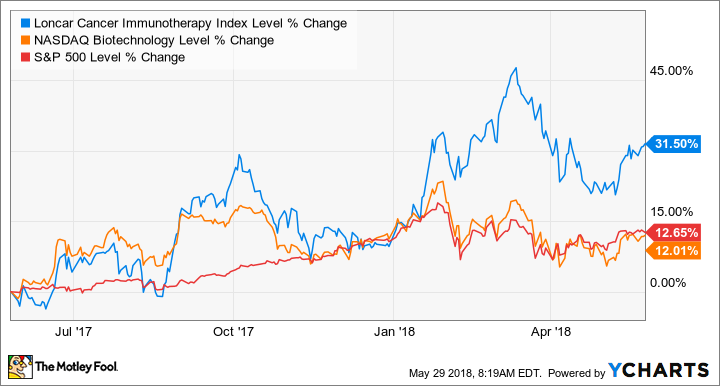 The general outlook for immuno-oncology is so bright that the niche index has thumped the broad market and the Nasdaq Biotechnology Index over the past year. The strong patient responses we've seen from revolutionary new drugs combined with a frothy market for biotech buyouts have sent quite a few stocks skyward. Before you jump into the fray, though, you should understand a couple of challenges that many immuno-oncology stocks will face on the road ahead. From a commercial standpoint, the most successful class of drugs that help the immune system fight cancer are the PD-1 inhibitors. Opdivo, from Bristol-Myers Squibb (NYSE:BMY), and Keytruda, from Merck & Co. (NYSE:MRK), weren't available a few years ago. But the pair will probably generate a combined $12 billion in sales this year. When these drugs work, the results make oncologists' eyes grow wide and misty. But they don't seem to work for most patients. Heaps of biotechs are trying to remedy the issue by developing fancy new drugs that work in tandem with PD-1 inhibitors, but old-fashioned chemotherapy has given them a tough hurdle to overcome. Earlier this year, Merck made waves when it announced that adding Keytruda to standard chemotherapy lowered newly diagnosed lung cancer patients' risk of death by half compared to chemo on its own. Most importantly, chemo plus Keytruda provided a survival benefit for patients who generally don't respond to PD-1 inhibitors on their own. Few patients would describe chemotherapy as cheap, but a year of treatment with new cancer therapies can cost end payers more than a modest home in the Midwest. In order to get governments and private insurers to cover a PD-1 inhibitor, plus another pricey new therapy, the resulting combo would have to produce amazing results. Unfortunately, combination studies to date with new drug candidates have been mostly disappointing, with the occasional exception. If you're considering any biotech stocks that derive value from new drug candidates intended to work in concert with PD-1 inhibitors, you would do well to temper your expectations. If you're interested in immuno-oncology stocks, odds are that a cell-based therapy caught your eye. Complex therapies, such as Yescarta from Gilead Sciences (NASDAQ:GILD), have produced amazing results for people who had already exhausted previous treatment options. Cell-based therapies generally do their job with a single infusion of a patient's own cells, after they've been modified to fight cancer. Perhaps the only thing more amazing than the treatments themselves is the rapid uptick in potential competitors. According to a recent report from the Cancer Research Institute, there were a stunning 753 cell-based therapies in development at the end of March, which is 350 more than the organization found just six months earlier. Gilead's Yescarta earned approval last October, and it racked up $40 million in sales during the first quarter. That isn't necessarily bad, but growth could be awfully difficult in a field that's about to get crowded. Yescarta targets a protein found on the surface of cancer cells called CD19, and it could have plenty of competitors in another year or two. The Cancer Research Institute counted 65 cellular immunotherapies directed at the same target in clinical-stage trials at the end of March. According to IQVIA, a healthcare data analytics provider, global spending on cancer medicine doubled over the past five years, to $133 billion in 2017. That's a lot of inspiration for ambitious start-ups eager to make their mark on the immuno-oncology landscape. There are going to be some big winners, like Keytruda, but investors need to realize that earning approval for new cancer immunotherapies is only half the battle from here on out. Among all cancer treatments purchased in 2017, just 13% were used by more than 10,000 patients, and the incoming tsunami of immunotherapies isn't going to make launching new ones any easier. With this in mind, investors want to be awfully selective when it comes to this niche of the biotechnology industry.